BLAEU, W. - Tabula Russiae. Tabula Russiae. - BLAEU, W.
Size : 16.7 x 21.5 inches. / 42.5 x 54.7 cm. 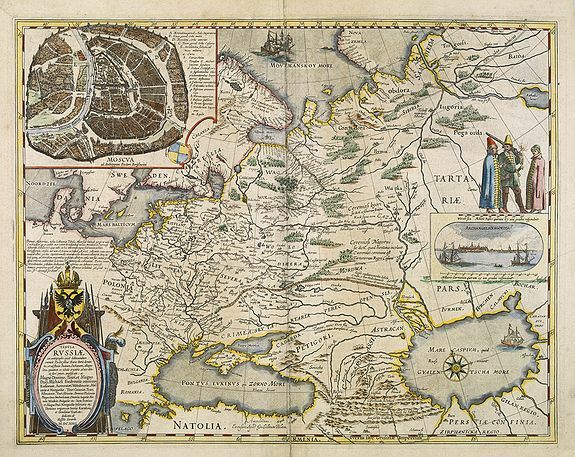 Description :A re-issue, by Willem Blaeu, of Hessel Gerritsz' rare and influential map of Russia. This fine map was compiled from manuscripts brought back from Russia, by Isaac Massa to whom the large inset plan of Moscow, with a 17-point key, is attributed. There is also a view of Archangel, Russia's only northern port until the founding of St Petersburg in 1700. Three figures in Russian dress stand above. Condition : In good condition. Repair of split lower part center fold, 5cm. Into engraved area. A dark impression.